Mallorca is the largest of the Balearic Islands in the Mediterranean Sea, just over 200 kilometres east of Valencia, Spain. Renowned for its stunning coastline comprising gorgeous coves, dramatic cliffs and turquoise waters, Mallorca is one of Spain’s top holiday destinations. As you would expect from a Mediterranean island, Mallorca boasts some excellent beaches. On the southeast coast, you’ll find one of the finest called Cala Llombards. The long, thin strip of white sand and shallow water make it ideal for families with young children. Cala Torta in the northeast offers large stretches of pristine sand and clear, deep water. This idyllic beach is perfectly suited for snorkelers and windsurfers and has a small seafront bar serving exquisite grilled fish, too. If you would rather spend your day soaking up the local culture and history, be sure to visit the fascinating Roman ruins of Pollentia in the north. The town was originally founded in 123 BC and quickly became an important city in the Balearics. Still visible today are the remnants of a theatre, a forum and residential areas. The island’s capital, Palma is the gastronomic hub. It offers a mix of upmarket restaurants and authentic tapas bars to suit all budgets, all serving exceptional seafood paella and a local herbal liqueur called ‘Herbs de Mallorca’. Palma’s most iconic feature is the beautiful yet imposing 14th Century namesake cathedral. It has a superbly decorated interior too, designed by Gaudi, which is well worth seeing. In Pollensa to the north, the 365 Calvari Steps ascend from the main square to the tiny Calvario Chapel at the top. Although the climb is challenging, you are rewarded with sublime views across the island throughout. 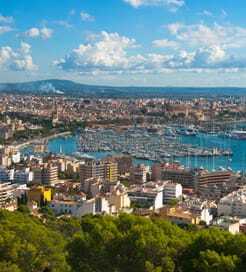 There are frequent high-speed ferry crossings between Mallorca and the other Balearic Islands of Menorca to the northeast and Ibiza to the southwest. You can also sail from mainland Spain, with frequent crossings from Barcelona, Valencia and Denia on the east coast. Caught the late Friday boat to Ibiza, which was a great start to the weekend. Party time started once we left dock, sundowners, drinks and alive DJ. Just a bit slow to disembark foot passengers. Comfortable clean seats, wide selection of food options. Great to sit outside to watch the sunset. 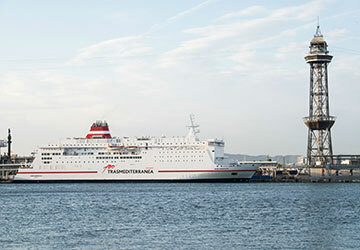 For more information, please visit our Ferries from Spain to Mallorca page. For more information, please visit our Ferries from Menorca to Mallorca page. For more information, please visit our Ferries from Formentera to Mallorca page. For more information, please visit our Ferries from Ibiza to Mallorca page. For more information, please visit our Ferries from France to Mallorca page.